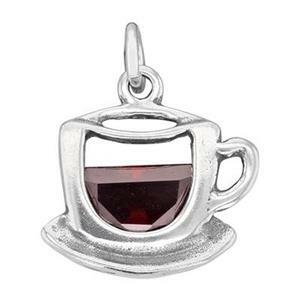 Sterling Silver 14.9x15.3mm Tea or Coffee Cup Charms with Cubic Zirconia. If asked how you take your Coffee or Tea, reply: Seriously! Very Seriously! Our SC629CZ – Bright Sterling Silver Tea or Coffee Cup with a Garnet CZ inside. CZ colors may vary slightly. For that Perfect Blend – use with our Sterling Silver Footage Chain or with our Sterling Silver Earring Findings. Notes: 4.9x8.3mm Garnet CZ, 1.6mm silver charm design, hollow back. CZ colors may vary slightly. Love these charms, super cute and very different!